Residential schools robbed us of our language. To bring Squamish back from less than 10 fluent speakers, I’m immersing myself for eight months.Growing up, you can’t help but notice the absence of your language.I come from Tsileil-Waututh and Squamish nations. My elementary school was mostly white, with a few native students. I don’t remember learning history on our First Nations people. At the time I was more worried about being different from my classmates. Then I moved up north in Williams Lake, where there were a lot more First Nations at my school. They have Shuswap, Tsilqot’in and Carrier languages up there, and my high school offered classes for all three. I was learning along with them, but it almost didn’t feel right, because I didn’t belong to it. I thought a lot about why there were so many elders up there, teaching their kids, because I didn’t get that growing up. I don’t know the exact numbers, but I’ve heard there were less than 10 fluent Squamish speakers at one point, with around 30 less-proficient speakers. Residential schools have everything to do with that. Our languages were taken away from us. It was forbidden to speak them. And the result from that was our people being afraid to know their own culture. It was almost not worth it in some people’s eyes to bring the language back. But other elders were strong enough to keep it going for us. Now that I am learning Squamish for myself, it’s raised my appreciation for those elders, who held onto it for us. It’s our turn to bring it back, and bring it back stronger. At the same time, I think colonialism is still quite strong—you still see it everywhere. I don’t think colonialism will ever stop, but this is our way of slowing it down a bit. As a teenager, I would come back to my territory for the summer and winter breaks. Then I could reconnect with my own culture. My dad got me into traditional singing and dancing. We’d take kayaks out for the day near Belcarra, and he would teach me about the islands there, which was a really beautiful summer activity. Language still wasn’t a priority back then because I didn’t think what we’re doing now was even possible. I’d never heard of a program like Kwi Awt Stelmexw, with full immersion, though there more of them popping up. I didn’t know too many Squamish speakers back then. It just wasn’t something I thought was possible for myself. It was one of my sisters who inspired me to immerse myself and learn the language. 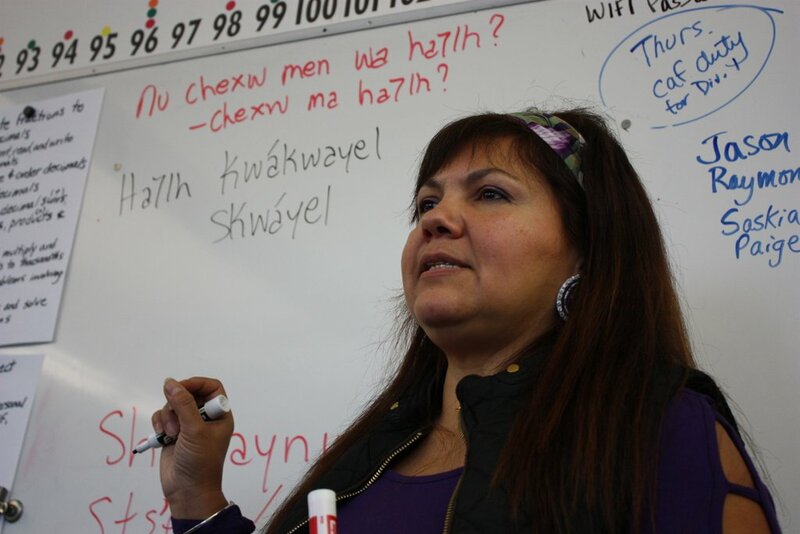 I watched her working to bring back the Henqeminem language for the Tsileil-Waututh. That’s where the spark hit, seeing her passion for the work. I thought I wanted to become fluent in the language I belong to.